Sydney, Australia -- The 2016 census shows Australians are less religious than ever before, but one religion is maintaining its popularity, with diverse celebrations planned across the country this weekend. The number of Australians who in the census reported having no religion increased from 13 per cent in 1991 to 30 per cent in 2016, while the number of Christians dropped from 74 per cent to 52 per cent. Between 1991 and 2016, Hinduism increased from 0.3 per cent to 1.9 per cent, Buddhism from 0.8 per cent to 2.4 per cent, and Islam from 0.9 per cent to 2.6 per cent. However, some Buddhists believe their percentage could be higher because increasing numbers of Australians practise Buddhism without officially identifying with the label. Pairoj Brahma, a former Buddhist monk from Thailand, lives on a farm near Mullumbimby in northern New South Wales, where he teaches meditation to people who practise Buddhism but do not necessarily call themselves religious. "Buddhism is growing rapidly in Australia because the core Buddhist teaching is somehow suitable to logical thinking and intellectual minds," he said. "It's about cause and effect, not things coming from the air. It's about seeing interconnectedness and how things are related to each other." Pairoj said Buddhism was not a one-size-fits-all religion, as could be demonstrated by the range of celebrations planned for the next few days. Many Theravada Buddhist communities across Australia, particularly those with connections to Thailand, Cambodia and Laos, will mark Buddha's first sermon this weekend in celebrations under different names, including Asalha Puja or Dharma Day. Pairoj said he generally chose not to participate in Buddhist ceremonies. "If the ceremony has a certain meaning to create a context and purpose and we know the logic behind it, that's OK."
Buddhist monk Phramaha Weraphong Ritchumnong will host Dharma Day celebrations on Sunday in the rural community of Richmond Hill, near Lismore in northern New South Wales. He said the Thai Buddhist community would come together to eat, chant and meditate, while marking the Buddha's first sermon which related to the origins and aftermath of suffering. "It's an important day because it was the foundation of the core concept of the Buddha's teaching, cause and effect," he said. 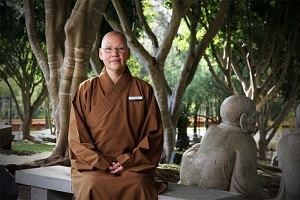 Phramaha said Buddhism had given him direction after his parents died when he was nine years old, but he believed westerners were attracted to the idea of peacefulness. "Becoming a monk and having no attachment has been good luck for me because I had nothing," he said. "When I studied deeper inside Buddhism I discovered it is very peaceful inside, and when you don't hurt yourself you won't hurt people around you." In the Hunter Valley city of Newcastle, the small but growing Tibetan Buddhist community is celebrating the Dalai Lama's 82nd birthday this weekend. Former monk Yeshi Sangpo, his wife Pema Tso, and their 17-year-old daughter Yangkyi Sangpo are Tibetan refugees who fled their homeland after Yeshi escaped from a detention centre, where he was detained by Chinese Police. Yangkyi said this weekend's celebrations helped to maintain Tibetans' connection to their religion and culture. "It's something that we're really proud of," she said. Yeshi and Pema work in aged care, while Yangki hopes to become a cardiologist. "You be nice to people and be compassionate to people and that's what we strive to do every single day," Yangki said. "Being a Buddhist, something that we strive to do is to help any person. No matter who they are we tend to help them." In the Illawarra region of New South Wales, Buddhists will hold a ceremony on Sunday to mark the enlightenment of Guanyin Bodhisattva. Reverend Maio You, director of the Nan Tien Temple at Wollongong, said Guanyin Bodhisattva was an icon said to be "the compassionate one". "Guanyin is the enlightened being who hears the sounds or the cries of the people," she said. "Without Guanyn, Buddhists will not have their cries heard and their sufferings liberated. "It's a significant day for Buddhists." The Nan Tien Temple is home to a shrine to Guanyin Bodhisattva, where the ceremony will be held on Sunday.